Well, the first Derby of 2012 is in the books. It was a gorgeous day at Lake Puddingstone and the fishing was (as expected) tough. I ended up fishing with Jack, Paul (carps up) and Nermin, and was lucky to hook into a nice 18-3 Common early on. There was plenty of surface activity but they didn't seem to like our offerings. 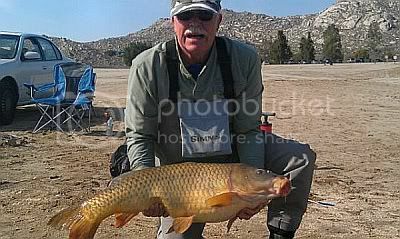 It took until 12:40 to see another Carp in the landing net. 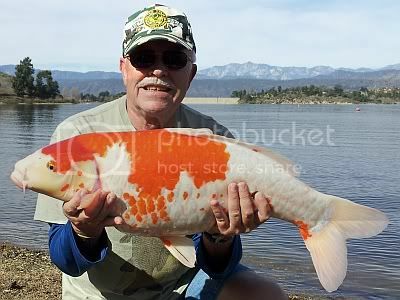 This time it was Paul's turn and he was able to land an awesome looking 14-8 Koi. Again, hours went by and at 4:53pm(!) 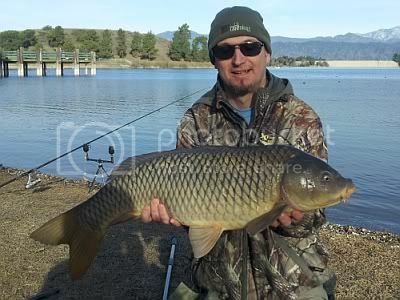 it was Nermin, who landed a nice 11-3 Common just before the end of the Derby (don't have a photo). 4th Place: Jack (Jack Mankin), Jered, Evan (EJB), Brian (CARPDOG), Paul (carpediem), Art (ArmenianCarpHunter), Henry (unface), Wayne, Mario (damien), Miguel (thecarpmaster), Derek (CarpOnTheBrain). It was great seeing everyone and shooting the breeze (and some coots ;-)) with Jack, Paul and Nermin. I hope to see you guys again at the next Derby. We hope to see you guys again at the next Derby.